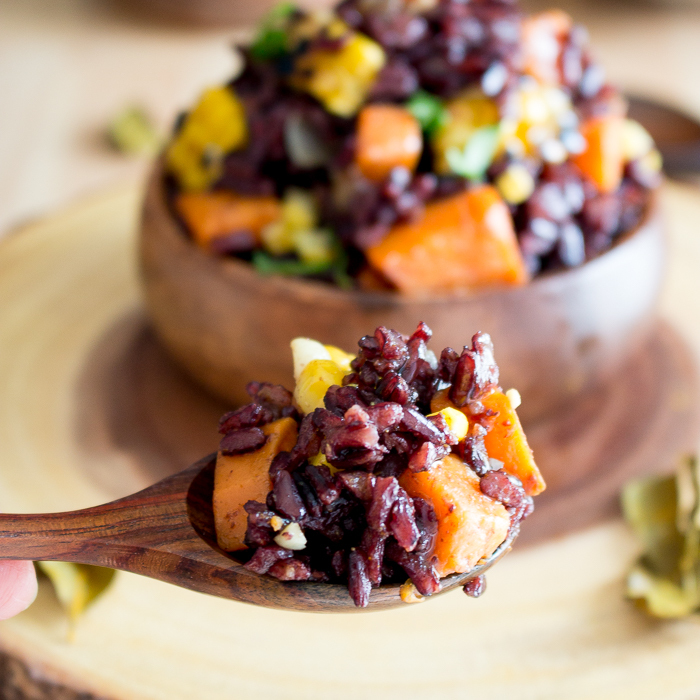 Curried Harvest Black Forbidden Rice (Emperor’s Rice) is so full of flavor and texture that it will have you going back for seconds, and thirds and fighting over the last bite at the table. Have you ever tried Black Forbidden Rice? You are going to love the delicious nutty taste of this Chinese ancient grain. 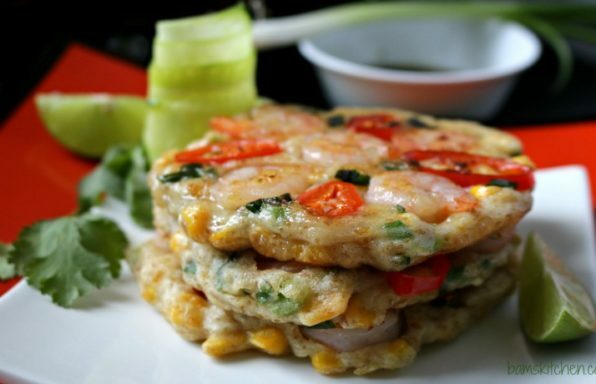 It has the largest amount of protein, fiber and iron compared to other types of rice. Black Forbidden rice is also high in antioxidants and is naturally gluten-free. Not only is it good for you, it is so cool to look at! Vibrant black color with a pop of color for your vegetables makes for one stunning side dish. 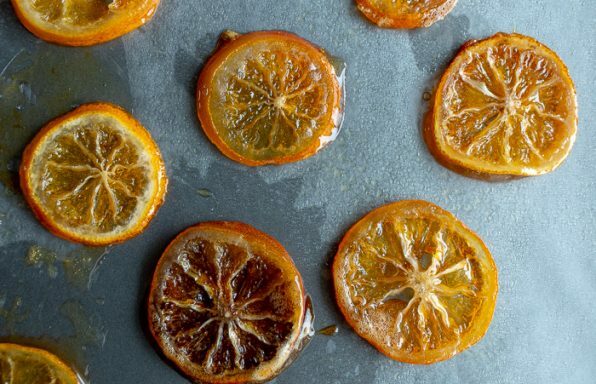 Halloween is right around the corner and how cool is it to have a black forbidden rice and beautiful orange sweet potatoes in this recipe to celebrate. 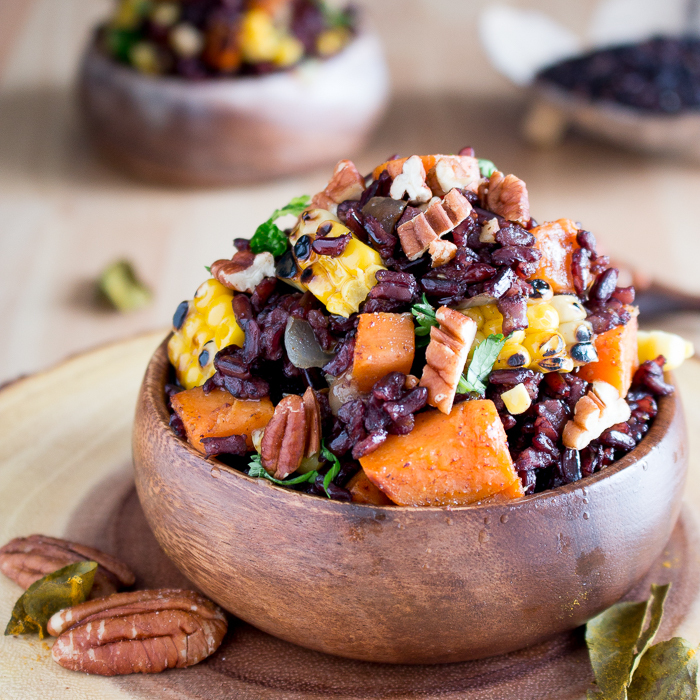 You are just going to love the subtle flavor of the curry, naturally sweetness from the autumn harvest corn and sweet potatoes combined with the nuttiness of the delicious black forbidden rice. 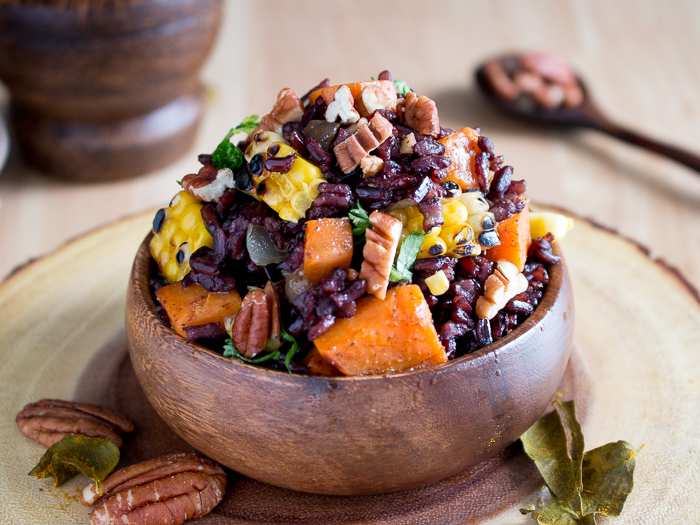 Curried Harvest Black Forbidden Rice is one cozy sweater weather wearing dish that is sure to be a crowd pleaser. Another bonus of Curried Harvest Black Forbidden Rice is its ability to feed the masses and solve all your problems, when you are serving your vegan family members and friends around the holidays. 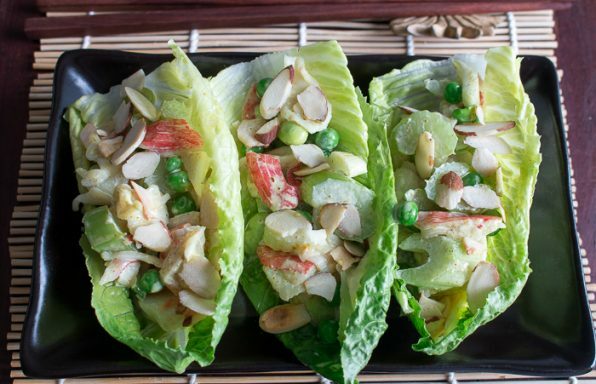 When you find out that your son has invited his vegan girlfriend for Thanksgiving dinner, there will be no more stressing out. This does not mean you need to serve a tofu turkey. OMG, that is insane. Keep everyone happy and serve a delicious roasted turkey and then include this curried harvest black forbidden rice as part of all the fixings. 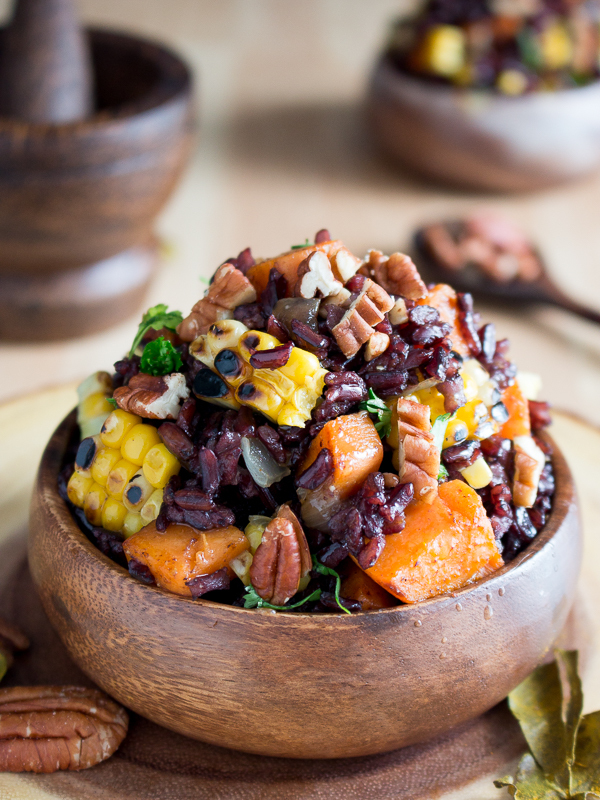 Curried Harvest Black Forbidden Rice and a tossed salad is all you need for a complete meal. 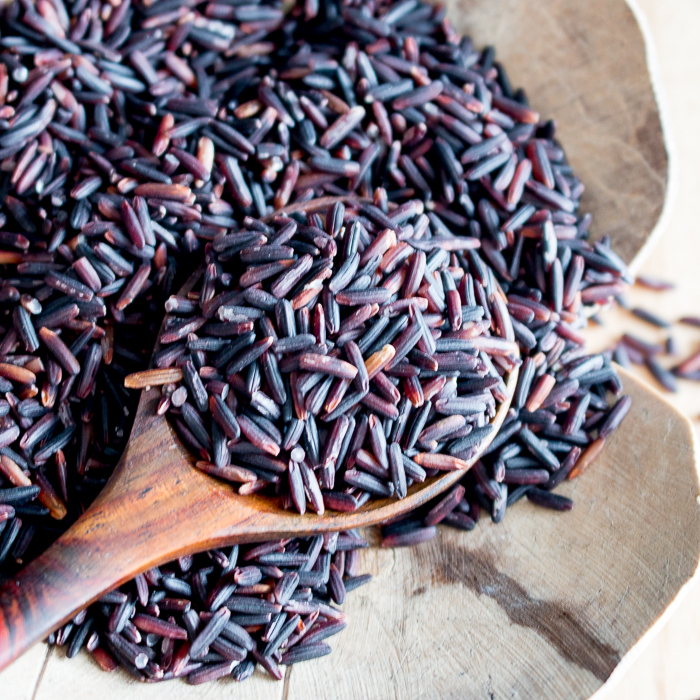 The Black “forbidden Rice” name stems from Chinese history. During the days of the Ching and Ming dynasties, Forbidden Rice was exclusively reserved for the Chinese Emperors to ensure their longevity and good health. 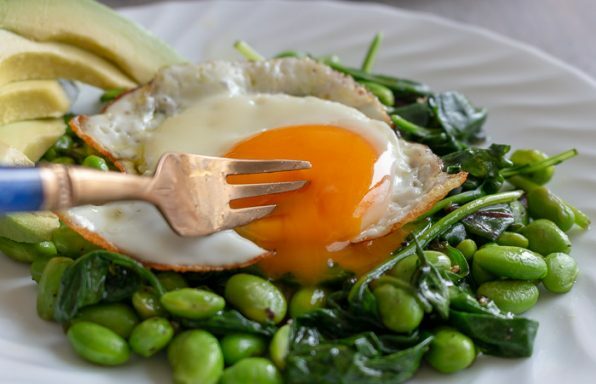 In Traditional Chinese Medicine (TCM), it is believed that this grain is good for nourishing the blood due to its high iron content and good for the kidney, liver and spleen. In addition, compared to other types of rice forbidden black rice keeps glucose levels stable because of the high fiber content. In China, Forbidden Black rice was only planted in minimal amounts and for many years was not available to the commoner. This is why Black Rice is called Forbidden Rice. However, now this delicious and nutritious nutty ancient grain is available in most markets and online for purchase. 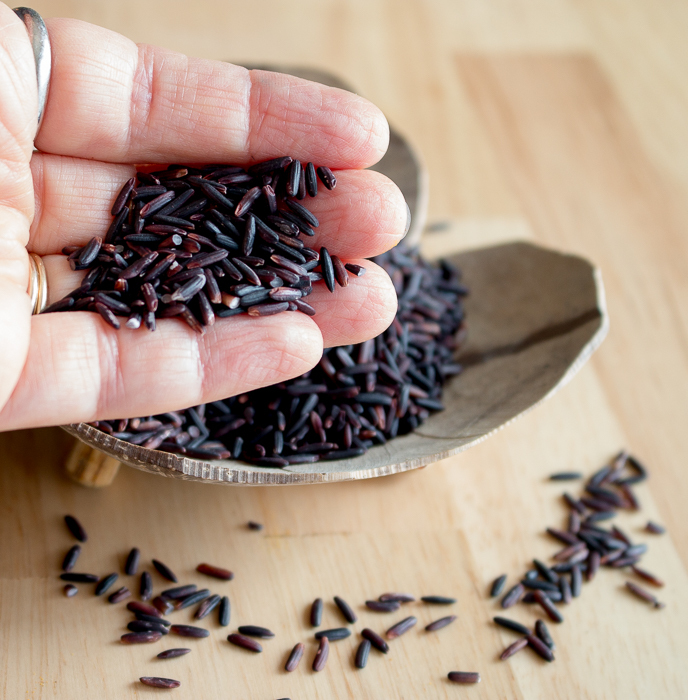 Did you know there are several different types of Black Rice (sometimes also known as purple rice or Emperors’ Rice) as it can turn a dark purple when cooked? There is also an Indonesian black rice, Thai jasmine black rice and there is even the type of glutinous black rice that is used usually in desserts. We did not use a glutinous black rice we used regular forbidden black rice. Please note that your rice will turn a slight purple hue when cooked and this is completely normal. Heads up if you are living in China as this happened to us! Sometimes, white rice is covered in a black covering that is not suitable for consumption. You will know it is fake rice because at the bottom of the bag, there will be black powder. Real Forbidden black rice should not have black powder at the bottom of the bag and should not cook in 12 minutes or less. If it does, you my dear have FAKE Chinese Forbidden black rice. You do not need to worry about this if you are purchasing your forbidden black rice from an established company but if you are buying it in the wet market in bulk, BEWARE! If you are having a craving for a rice dish be sure to try our Vegan Chickpea Lemon Rice , Kimchi Pantry Fried Rice or our Everything you need to know about making Pantry Fried Rice . 2In the meantime, in a large wok/frying pan add your olive oil, onion and garlic until translucent. Add your sweet potato and 2 tablespoons of water to the pan and cover with a lid and cook over medium heat until the water is absorbed and your sweet potatoes are cooked or just until you can pierce with fork. Do NOT overcook! Take off the burner and set aside until the forbidden rice is cooked. 3Add your cooked forbidden rice to the cooked sweet potato and onion mixture. 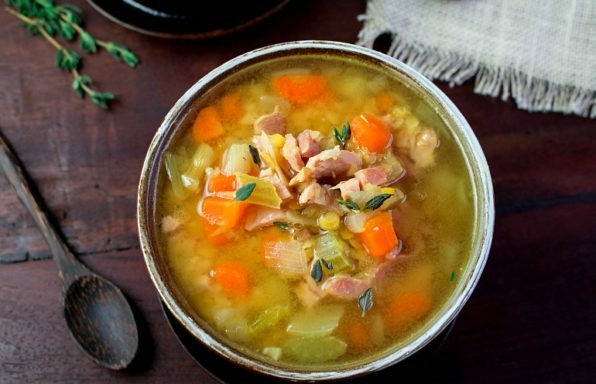 (You may need to add an additional tablespoon of olive oil to prevent sticking) Add cooked sweet corn, curry powder, vegetable bouillon, salt and pepper to taste. Stir Fry until ingredients are well incorporated. Add Crushed pecans. 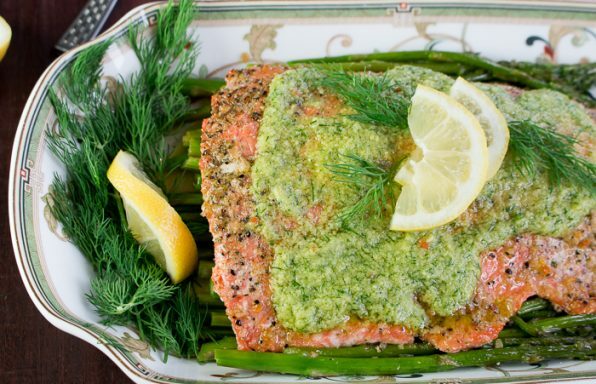 4Garnish with parsley and enjoy!